Welcome to my first Teacher Tuesday post for 2018 – and, of course, welcome to the new school year. If you have missed my previous Teacher Tuesday posts, links to those are at the end of this post, offering lots of ideas for using my books in your classroom. This week, I am sharing suggestions for using Australia’s Great War: 1915 in your year six classroom, though of course the activities could be adapted for an older or younger class as well. Blurb: When Australia throws its support behind Britain in its fight against Germany, young teacher Stan Moore is one of the first to join up, swapping the classroom for adventure in Europe. But the 11th Battalion is sent with the newly formed Anzac Corp to Gallipoli where Stan is confronted by the hard lessons of war. Though conditions are dismal and death is everywhere, so is the humour and bravery that is the true spirit of Anzac. Sally’s Recommended Grade Levels: Year 4 – Lower Secondary, but these suggestions focus on Year 6. Before Reading: Class or small group work – brainstorm knowledge about World War 1, and, particularly, Gallipoli. Start a class ‘fact’ wall, where facts about WW1 are added progressively during the unit. Have students verify facts, using internet sources and/or class library, and reference the source on their additions to the ‘fact’ wall. 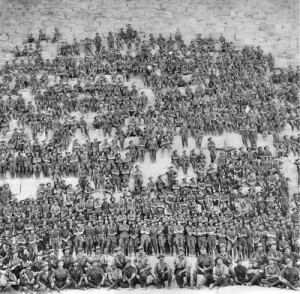 Information to consider: key dates of the war, key dates of Gallipoli campaign, countries involved, numbers of Australian who served, casualties, fatalities etc, geographic locations, famous people involved etc. Operation Click (available here) has useful fact sheets and worksheets. Before reading – Examine front cover. Focus on the character pictured – the main character (Stan). Discuss – what kinds of people served in WW1? What would we expect Stan to be like – age, employment background, any special qualities etc. Examine rest of cover, including the photos and blurb. Journal writing, or discussion: From examining the cover, do you anticipate enjoying the book? Why/Why not? What do you know about Stan from the cover information? What do you think might happen to Stan in the story? Encourage students to give evidence from the cover and from their knowledge of WW1. Before Reading – Focus on the concept of bravery/courage. What do these words mean? In groups, students to crate posters, providing a definition of bravery, and giving examples of what bravery might look – at war, and in everyday life. During reading, focus on key moments of bravery, including the landing at Gallipoli (chapter five), Stanley helping Colin (pp. 67-68), Simpson (Chapter 9), Miles helping the Turk (Chapter 10), Stanley and others staying aboard the Southland (chapter 17). Encourage students to identify other kinds of courage: returning to Gallipoli after hospitalisation, using humour to get through, writing letters which don’t reflect just how bad things are etc. After Reading: Groups to revisit their bravery posters, and create a second poster identifying instances of bravery from the book. Share posters with whole class, and discuss whether concepts of bravery have changed through reading the book. Use worksheets from Operation Click (here) to explore the concept of the ANZAC legend. After Reading: Compare 1915 with other accounts of Gallipoli. Historic accounts, from newspapers and books can be found on Trove, and elsewhere, Contemporary nonfiction accounts in textbooks or online (here’s one to get you started), and fictional accounts are numerous – including the picture books listed here. Read and/or view a number of accounts, and have students compare by creating a table, focussing on: attitude to war, events focussed on, word choice, other aspects. After reading, discuss reactions to the book. Look back at predictions made about enjoying the book, and discuss whether the book met expectations. Examine sample book reviews, and identify elements. (You can find many book reviews on the Reading Time website. 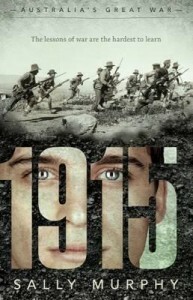 There are also reviews of 1915 here and here). Students to write their own review of 1915. Alternatively, create a Booktalk or Book Trailer for the book. There is a sample Booktalk for 1915 HERE, and a Booktrailer for one of my other books, Toppling, HERE. Reread Stanley’s poems (p. 77 & p. 169). Discuss why Stanley wrote poems, and why Charles Bean decided to put together the ANZAC book. Students to attempt their own poem about either another moment from the book (perhaps Miles’ death, or the landing at Galllipoli) OR about something difficult they have experienced. Letter writing. Reread a selection of Stanley and Elizabeth’s letters. Write e letter from one of the characters after Stanley has left Gallipoli for the last time. OR Discuss how their letters differ from modern communication. Imagine they have mobile phones or email and write a text or email exchange between the two. Make red poppies for ANZAC Day or Remembrance Day. Simple instructions can be found here. Geography/HASS: Create a timeline for the Gallipoli campaign. Using a different colour or font, insert key events from the book. Show students this real photo which features in the opening scene of the book. Previous Teacher Tuesday posts include: Pearl Verses the World, Looking Up, Toppling, Roses are Blue, Do Not Forget Australia, The Sage Cookson Series, Snowy’s Christmas and The Floatingest Frog.